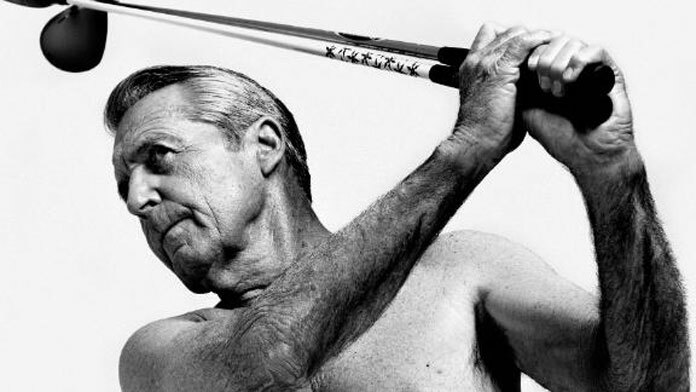 The fitness story of Hall of Fame Golfer Gary Player, who is a cover athlete in ESPN The Magazine's 2013 Body Issue. GP: Very few people do what I'm doing at my age. I want to show the world how fit you can be at this age and not just accept being old. I still work on my ranch, I represent a lot of companies, I do golf course design, I'm traveling seven months a year. You've got to keep moving. If you sit and watch TV on your backside all day, you're going to die. Posing in the magazine is just part of my plan. My big dream now is to help people become healthy. Obesity, as far as I'm concerned, is the greatest problem facing the planet at the moment. What worries me is there is nothing worse than when you see children getting all of these diseases now. Look at our foods; our foods have steroids in them, antibiotics. People are overeating and eating all kinds of fatty foods and high sugars and junk. We have a massive challenge. It's actually easier to get a camel through the eye of a needle than to get the average man to worry about diet and exercise. GP: Every day, I do a little bit of stretching. The rest of my workout depends on where I am. On my ranch in South Africa, I have a mountain outside my house, and I built steps up it. I climb those steps in the morning and then go to my gym. Even my wife at 76 climbs it slowly. All my guests love to climb it. It's a big puzzle: climbing steps, eating properly, exercising, walking a lot, never taking an elevator when I don't have to. What is the most important exercise you do? GP: I used to do 1,000 sit-ups a day; now I'm up to 1,200. I do all different kinds of core exercises: lying on the medicine ball; holding a weight and rocking right to left; crunches with a 100-pound weight on my chest, sit-ups with my legs up. Core is No. 1, but it's all important. I exercise everything from my head to my toes every time I exercise: neck, shoulders, biceps, forearms, fingers, wrists, stomach, thighs, calves and feet. Most people my age, their feet ache, but I never have a twinge of pain because I've exercised my feet for years. What got you so into fitness? GP: My brother went to war when he was 17. Before he left, he asked me, "What do you want to do?" I said, "I'm going to become a professional sportsman." I didn't know about golf then; I thought I would play rugby or cricket. He said, "Well, you're very small in stature," and he bought me some weights. "I might not come back. Will you promise me you'll exercise?" I did, and I've adhered to that for 63 years. How did the golf community view weight training and exercise when you first started? GP: I was ridiculed. Never mind teased -- ridiculed. The night before the 1965 U.S. Open, I was squatting 325 pounds. And they said, "Gary Player is a nut!" "Gary Player will never last past 35!" "You cannot do weights and play golf!" GP: I'm 70 percent vegetarian. In the morning, I don't have any fat -- no bacon, no sausage, no butter; instead, I have juice. Everyone should get a juicer and put vegetables in it every morning. I think that is the great secret to health. I avoid animal fats and eat a plant-based diet as much as I can. Of course, it's not easy. I'll go out, and they'll have all sorts of food, so I'll have a third of a piece of chicken. But I'm mostly vegetarian, so I eat a lot of vegetables, fruit, garlic, onions, good nuts (walnuts, almonds, no salted and oiled nuts), whole wheat bread. But 70 percent vegetarian is not good enough. I want to be 85 percent. The human body is built to live to at least 100. But it's very hard to live to 100 today, in spite of our medicines. Sometimes more people die from the medicine than from the disease, I believe that emphatically. I don't take any medicine, neither does my wife, no pills whatsoever. No vitamins, no pills, nothing. But it's very difficult for people to live to 100 today with the junk that we add to our food. I'm a rancher, and I see what people do to their cattle to make them fat so they can get more money for it. I see what people do to their chickens. How the hell are you going to live until 100 with all the stuff that is in our foods? It's a miracle to live to 80 today, I think. Of course, there's a big difference between living and existing -- a big difference between living and existing. Do you allow yourself any junk food? GP: I'm a normal human being. I allow myself one cup of coffee a day, though I don't think coffee is good for you. If you try to deny yourself entirely, it won't work. I have a Snickers when I want one. Lee Trevino teases me. He roomed with me at the U.S. Open once and he said, "I went to make Gary's bed and next to the pillow were two big Snickers!" I am not a martyr, I love my chocolate and I do everything in great moderation. If you don't watch what you eat, you've had it. A great man in India said to me, "Mr. Player, the less you eat, the longer you live." In Western society, it's "eat plenty and die young." How does your energy level compare to when you were younger? GP: I have unbelievable energy for 77. I still work on my ranch. I help the staff mix cement, I help them carry poles; I do all the stuff I did as a young man. I would say I have the energy of an average 45-year-old. What do Jack Nicklaus and Arnold Palmer make of your physical condition? GP: I just played in the Legends [in Savannah, Ga.] with Jack. I was walking, and he was in a cart, and he said, "I really admire your fitness. You're the Energizer bunny." Arnold never says anything about it, but Jack and I discuss it because I'd like to see him lose 30 pounds and get in shape. He says his legs hurt him and his body is hurting him. I'm continuously talking to him about it. What would you define as your mental edge? GP: I never say I need to retire and relax. I relax by what I do; what I do makes me relax. I love being with people. I love working for all these companies. I love getting up at 5 a.m. and working on my ranch and being with the horses. Then I have my 23 grandchildren who make me relax. I'm lucky. I'm blessed that I enjoy my work. My father worked in a gold mine for almost 40 years, 10,000 feet under the ground, making $150 a month. Do you think he enjoyed it? The trouble with Americans is they don't appreciate America enough. They are just spoiled rotten. The young people want things for nothing. The thing that made this country so great is that people got off a boat from Europe and had nothing, and they built the greatest country in the world through hard work. How does being in shape help your golf game? GP: It's the reason I won 18 championships! I'm the only man who won the career Grand Slam on the regular tour and the Grand Slam on the senior tour. The only reason I did that was my fitness. I think my Grand Slam on the senior tour is better than my regular Grand Slam because I had to do it after the age of 50. Nicklaus tried, Palmer tried, Tom Watson tried, but because I was so fit after 50, I was able to do it. The last nine holes is where a tournament is won, and I wasn't as strong as Palmer and Nicklaus, but my goodness, I was a lot fitter. And today, I'm 10 times fitter. When you come down the last nine holes, that's when you've got to be fit, that's when you have to combat the nerves. Nerves are an integral part of the game. On the last nine holes, I'm very comfortable. I'm in a zone. I know I'm strong, I know I'm fit, I know I'm going to be thinking well and making the right decisions under pressure. What is the most important muscle in your body? GP: No question: your core. That holds your body together. Most people my age haven't seen their private parts in 10 years because they have such a big stomach. And they never will again. GP: At nearly 78, I'm doing all this exercise, and then I go play golf and twist my body. I visited a chiropractor recently, and he said, "You shouldn't be able to walk. You've hit millions of balls, and your spine shouldn't be holding up to it, but your core is so strong that you manage to keep going." Eventually, age gets the better of you, but it certainly hasn't gotten me yet. It will start sometime, but you can prolong it for a long time.